Review: Bob Harris is a faded music star and Charlotte is a young woman. They cross paths in Tokyo and form an unlikely friendship. When this film came out I went with my sister to go and see it. I slept through the first half and my sister slept through the second half. At the time I found this to be really boring because not a lot happens. I recently tried to give this another go to see what I missed about it. I was hoping that I would change my mind and really enjoy it. The truth is I still found it to be exactly the same. I am sorry for all these people I might be offending but I am just telling you how I feel. I just don’t get the whole film at all. I have not enjoyed any of Sofia Coppola’s work. I wanted to enjoy it more than I did. At the Academy Awards in 2004 this won one Oscar and that was for Best Writing, Original Screenplay. The same year but at the Golden Globe Awards it did a bit better and picked up three Awards. They were for Best Motion Picture – Comedy or Musical, Best Performance by an Actor in a Motion Picture – Comedy or Musical and for Best Screenplay – Motion Picture. At the Baftas also in 2004 it won three awards and they were for Best Performance by an Actor in a Leading Role, Best Performance by an Actress in a Leading Role and also for Best Editing. 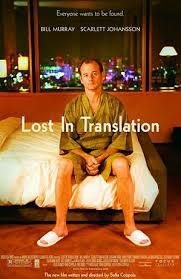 This is Bill Murray’s favorite film of his own. The director wrote a lot of the film based on her life.